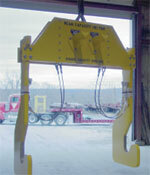 Do you have a need for a custom fabrication or part that you either do not have time or expertise to design? American Crane’s highly qualified engineering department can design innovative solutions that can be translated into drawings and manufactured fabrications and parts. American Crane has been required over the years to create unique design and manufacturing solutions to support our custom crane manufacturing program.This same expertise can be used to design and manufacture almost any welded fabrication or part that can be imagined.